With Victor Smolski and Peavy Wagner headed their separate ways, we're seeing the end of an era in Rage's history, a fifteen-year lineup of the band that saw their most daring work to-date. Smolski's incredible guitar abilities combined with his neoclassical and power metal leanings were responsible for a lot of that, and if you don't think so, just take a look at what Rage looks like without him. The Devil Strikes Again is meat-and-potatoes Rage that strips away the vast majority of the guitar noodling and orchestral stylings of the last decade-and-a-half in favor of the heavy metal sound they had in the 90s. 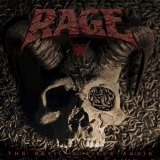 Due to the way Rage has changed over the years, this is no doubt going to be divisive; listeners who enjoyed Rage because of Smolski are quite likely to pan this one, but longtime fans who enjoyed the days of Black in Mind or the latter parts of the Manni Schmidt period might welcome the "back to the roots" treatment here. But by his own account in interviews, Peavy considers the 90s his best songwriting decade, so the sound on The Devil Strikes Again shouldn't come as a surprise. The title track is fast and thrashing, and it sets the precedent of the emphasis being much more on a heavy rhythm and a strong melody than on the guitar chops. Guitarist Marcos Rodríguez, who formerly played in a tour headliner band influenced by Rage, appears unlikely to step into the monstrous shoes his predecessor left behind in the soloing department; the solos are present and quite decent, but look pretty ordinary compared with the spectacular fireworks show Smolski was able to deliver. The riffing is as good as ever though, chock-full of those palm-muted arpeggios the band loved doing back in the 90s, and Peavy's classic rough voice and ability to write a catchy melodic song continue to be stone-axe reliable. Back on Track, another finely-constructed thrasher, or The Final Curtain, a Teutonic rocker with former drum tech Vassilios Maniatopoulos hammering the double-kick on the chorus somewhere down in the bottom of the mix, give off a feeling of energy, as if Peavy's been wanting to revisit plain old heavy metal for a while and has finally been given the chance. That energy stands him in good stead and keeps the newest album, powered by a less-experienced and arguably less-talented lineup than the last one, snappy and heavy. A few songs do fall flat -- Deaf, Dumb and Blind slows down and gets repetitive to the point that the listener might fear that Peavy, after over thirty years and 21 albums, might be starting to drag. But it's just another artifact of the quirky inconsistency Rage was known for since the 80s, and it's a rare miss in an album filled with hits. As if to underscore the point that the album is a return to a simpler and heavier sound, the last track, The Dark Side of the Sun, leaves the album as it began, in a furious blast of thrashing, with Peavy putting in his most emotional vocal performance here and Rodríguez's soloing hitting a level of complexity not seen most of the time. One of the lyrics on the chorus of The Dark Side of the Sun goes "I'm almost dead and gone", but The Devil Strikes Again sure doesn't sound like anyone is ready to be just yet. With an album containing the same combination of heaviness and off-the-wall enthusiasm Rage has been able to channel forth since their Avenger days, Peavy proves that he doesn't need any brilliant neoclassical guitarists to help him write a good metal album -- as long as the listener is willing to let him keep it simple. While no one can deny that the Wagner/Smolski lineup was often greater than the sum of its parts, The Devil Strikes Again shows that even one of those parts can be pretty damned good too.